If you have special needs for lighting control, you should call on us. We have satisfied customers because we listen to you. In addition to complete design service, you can count on Treatments for your Panes to deliver prompt installation by professionals. Contact us to talk things over. In our portfolio section you can browse many of the treatments we have developed with our customers. We offer unique, up-to-date window dressings from valances to draperies. Moreover, we are proud to provide the complete Hunter Douglas line as an Alliance Priority dealer. Hunter Douglas products allow you to master light control: to change it, shape it, and control it. Take a glimpse of some of their products below. Remember all their products carry an exclusive lifetime limited warranty. We also offer budget-conscious collections from other vendors. We offer color consultation and color palette selection for a single room or your entire house. 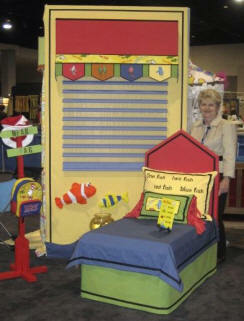 Deborah won honorable mention for her design of Dr. Seuss book entitled, “One Fish, Two Fish, Red Fish, Blue Fish” as announced in Draperies and Window Coverings magazine.